My daughter loves sleeping in her tent. Now she has a great cotton sleeping bag that is comfortable, washable and cute! I saw a mat made like this online, but then wanted to add my own touch -- an attached sheet so it doesn't end up separated or outside the tent! 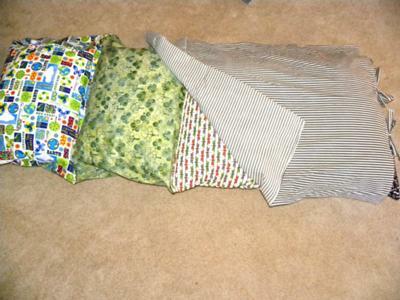 Make four pillowcases (I use the tube method). Add velcro on the ends so pillow does not slide out. Stitch all four cases together. On the bottom case, add two tie-ons and when adding the sheet to the top, add two tie-ons to that too. You're done! Here is extra help in learning how to sew pillowcases. Ha ha… I have actually done this when I was a kid and I had to sleep on floor. Since I hate to sleep on bare floor, I used to place pillows from the sofa and all to make a small bed for me.